Zhou Yilun is an artist and a curator. "二割三分" (にわりさんぷん/Niwari Sanpun), which literally means 23% in Japanese) is a Japanese jargon used in the process of sake making. For the purpose of refining quality, rice will be polished to 23% of its original volume before vintage. In Japanese, "割" and "分" are both measure words, "二割" means 20%, and "三分" means 3%. However, "割" and "分" are both verbs meaning cutting in Chinese (same characters as in Japanese). When the artist names this exhibition as "二割三分", the mis-reading of it in Chinese delivers the exact concept of the new works — by cutting and restructuring his previous paintings, the "quintessence" in his eyes are created. In Zhou’s daily work, he pays more interests in "the disposed" rather than "the essential", and enjoys exploring more possibilities as well as creating better value from "the residual". The works shown in this exhibition are cut and reproduced from the works that are unfinished or unsatisfying by the artist in his studio. 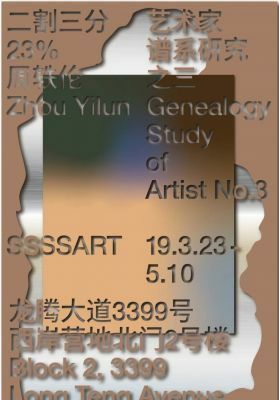 Zhou decided to cut off the "subject images" — "There is nothing more than figures. I’ve re-painted them many times, but still not satisfying. Therefore, I would rather cut them off, and in result, the rest becomes a lot better." (Zhou) The Artist gets rid of the "quintessence" in traditional context of pictures and attaches the aluminium plates behind the canvas, so the backgrounds from the original works have become the core of the pictures as a new serial of paintings. During the creation, Zhou is accustomed to "profligate" all the remaining brush paints on idled board or canvas. These “doodling images”, which he made by getting the most out of the paints, construct his new “subject images”. By cutting the subjects and attaching aluminium plates as backgrounds, the random images of Zhou’s casual brush-wiping have turned out a complete work. The two works What You Need Is A Thorough Reforming and Why There Are So Many Things We Can’t Remember which are created by this way just echo to the concept of "二割三分". Nevertheless, "making waste valuable by accident" does’t work all the time. "I thought it was a great way to go, but actually it was too pretentious. I failed several pieces when I continued with this method." (Zhou) From Zhou’s perspective, how to discern the "quintessence" has become a significant question. What are "wastes"? What are "essentials"? Both depend on the artist’s control over momental occasionallity.